As a mechanic at Rutland Cycling, I have seen the massive influx of electric bikes into the market over the last couple of years first hand. Under normal circumstances you’ll find me hurtling around on nothing other than my trusty green Brompton, resisting the urge to follow the crowd by getting myself an E-Bike. Sure, electric assistance makes it easier to cover long distances and you can climb the steepest of hills with ease (something the trusty Brompton certainly does not do! ), But when the bike does much of the work for you can you really have as much fun? Does a ride feel as rewarding? I was soon to find out. 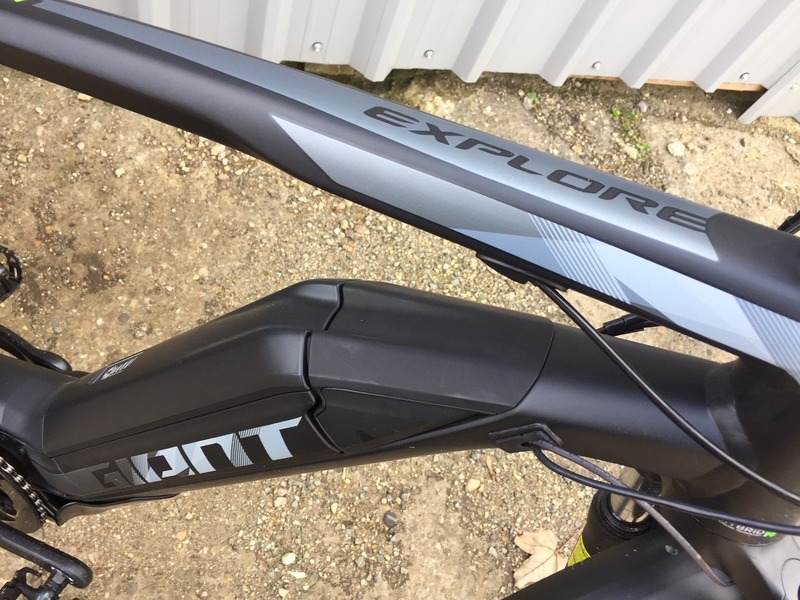 Recently I was given the chance to test-ride a 2018 Giant Explore 1. I was unsure what to expect- especially considering I’d been riding a folding bike for the last few months – something that couldn’t be further from an electric bike like the Explore E-1. I felt like a jockey being told that instead of a calm and controllable horse, I would be riding a particularly angry and energetic tiger. I need not have feared. I found the Explore E-1 exceedingly comfortable to ride. The excellent 63mm suspension, complimented by the fast-rolling 29r PX-2 wheels and ultra-grippy Schwalbe Smart Sam Tyres made riding on any terrain, even loose gravel, feel smooth and safe. By this point I was absolutely flying. I had heard talk of the so-called ‘E-bike smile’ and thought it was all a slightly corny marketing ploy but my word, by the time I’d felt the kick of the SyncDrive motor and I began to fly around the trail as if I was 18 again, the smile on my face could be seen from space! The motor worked brilliantly, delivering enough power in the sport mode to get myself and all my kit up the hills with absolute ease. On the flatter sections I decided I wanted to put a little more effort in – putting the bike into eco mode meant that I was still having to use a fair amount of muscle-power and, to my surprise, the bike rode exceptionally well even when using no assistance at all. I had always assumed that an E-bike would be incredibly heavy and nigh-on impossible to ride as a ‘normal’ bike, but I had underestimated the huge effect that the advances in the technology over the last couple of years had made to the E-bike experience and the Explore E- 1 is truly a dream to ride no matter what level of assistance (if any) that you choose to ride it in. The range was fantastic too. From a fully charged battery I was getting readings of 185 kilometres of range in the eco mode, 140km in the normal mode and 100km in the sport mode. Not a bad return considering that five or so years ago you would have struggled to get anywhere north of 60km of range from most electric bikes that were available and even if you did they certainly weren’t as fast or enjoyable to ride. In addition, the Giant Explore E- 1 comes with some very user-friendly components such as built in lights that run off the battery. 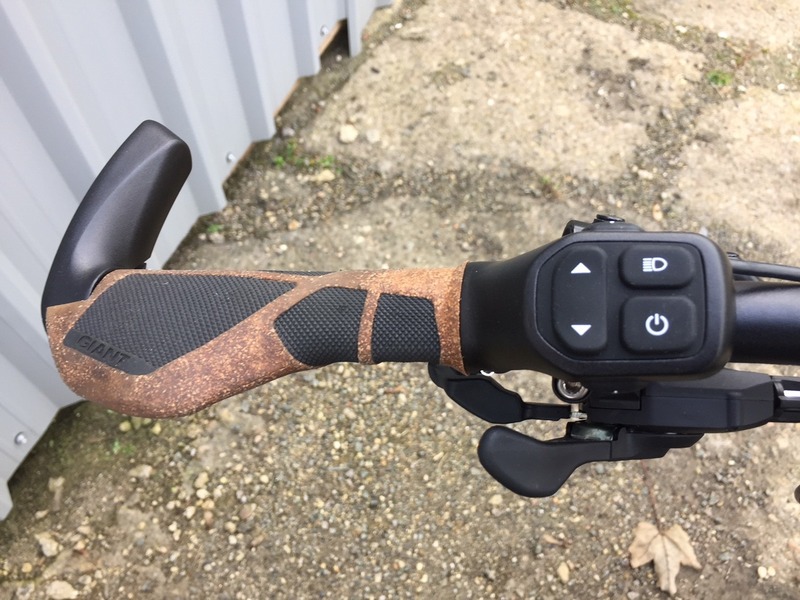 This would be a great addition to any commuter or night rider, taking away the stress of ensuring you have spare batteries or access to a USB charger in case your lights were to run flat. The front beam is bright and effective whilst the rear beam is plenty sufficient to ensure you will be seen by other road users. The only drawback is that the rear light does not have a flashing option, so I personally would want to put my own set of flashing lights on the back if I was riding somewhere busy in the dark. Another useful feature is the rear pannier rack and mud guards that come fitted as standard. Both of these features are essential for a bike of this style, designed to predominantly be used as a commuting tool, as you can fit pannier bags to carry spare clothes and laptops whilst the mudguards will ensure you don’t have to suffer the ignominy of arriving at work with mud all up your back! But after that then who knows, after my ride on the Explore E and after realising how enjoyable and rewarding an E-bike could be, I may well find myself a permanent E-bike and follow the crowd I had resisted before into the blissful world of electrically assisted cycling. Neil was riding the 2018 version of the Explore E, below is the brand new 2019 version. 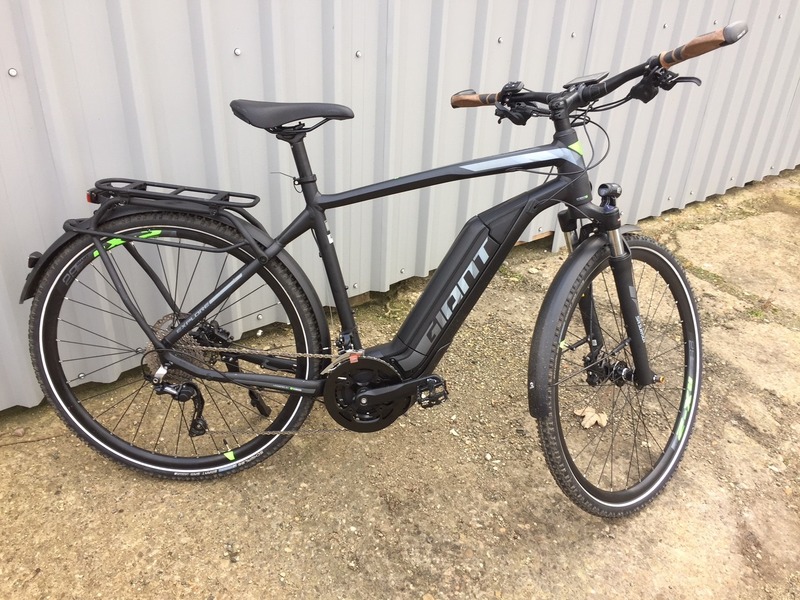 Giant's Explore-E is extremely versatile, whether you're city riding or trekking, this bike will handle it all, with a powerful 250W motor and a 500Wh battery, this bike has all the range available for a long-distance adventure. You can browse the entire E-Bike range online, or you can get your hands on it in your nearest Rutland Cycling store.